Mercedes recently marked debut of its all new AMG Sport line with the release of Mercedes-Benz GLE 450 AMG Coupe 2016. This Mercedes looks all planned to hit the market with its regular amenities to get adored with powerful AMG. The all wheel drive GLE 450 AMG will get its power through a V6 twin-turbo engine and as far as the speculations go, the model is anticipated to very well compete with the BMW X6. Let us see what makes it so special. The interior of Mercedes-Benz GLE 450 AMG Coupe 2016 is both luxurious and sportive with soft touch leather and Alcantara covering the entire interior getting well accompanied by sport seats in front of a dynamic sports steering wheel wrapped in Nappa leather. Center stack of GLE 450 AMG Coupe finds its roots in the recent C-Class and S-Class models with the infotainment display being partially on dashboard and rest beneath holding COMAND controls in it. The interior color range of Mercedes-Benz GLE 450 AMG Coupe is as vast as brand’s glory, ranging from single tone works to dual tone, giving black a catching contrast of Ginger Beige, Crystal Grey, Saddle Brown and Porcelain. 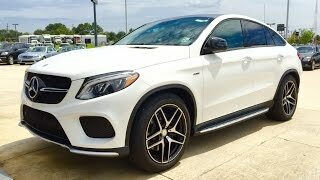 The exterior of Mercedes-Benz GLE 450 AMG Coupe 2016 very well portray company’s intention to beat its competitor BMW X6. The sleek upper body gets commendably complemented by the muscular lower part. The ferocious look it gains through fenders, large wheel arches, massive grille amidst above the air intakes, looks like luxury is protected by its guards. 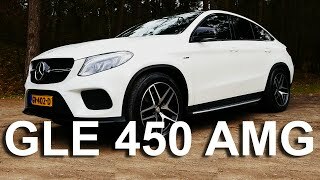 To add touch of elegance to the aggressive exterior GLE 450 AMG Coupe gets blend of chrome strips connecting above mentioned units. To add more to this new sporty lineup company has added, rear spoiler lip matching the body’s color, side skirts get a revision while the bumpers get a touch of aggression right above the massive 21” AMG light alloy wheels with an option to switch for 22”. 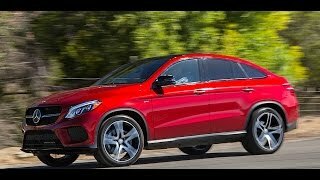 Mercedes-Benz GLE 450 AMG Coupe 2016 gets its power through a 3.0 Liter twin-turbo, direct injection gasoline V6 engine. The engine delivers 362 hp and 521 nm torque paired to 9G-tronic nine speed automatic transmission. 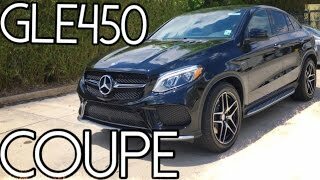 Apart from these statistical data Mercedes Benz GLE 450 AMG Coupe gets series of packages to sustain in competition prevailing in the automotive market.